The most beautiful city in the United States of America is probably San Francisco. The city is located in California on a peninsula that sits at the San Francisco bay entrance along the Pacific Ocean. San Francisco has modern skyscrapers and many Victorian-style buildings. 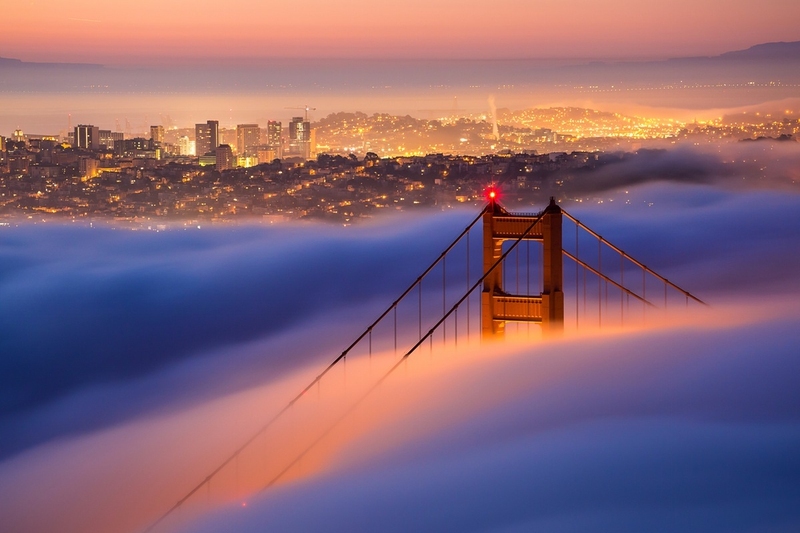 The city is known for the bridges crossing the Bay of San Francisco. The most famous one is the Golden Gate Bridge built in 1937. The city has about 780,000 inhabitants, while the bay has more than 7 million. Among all these, the weather in San Francisco also attracts a lot of attention. Looking forward to visit San Francisco for the first time? Do bring with you some warm clothes. You’ve probably heard that it’s pretty chilly. Yeah, that's true, although its climate is relatively mild, which rarely gets out of the range of 55 – 56 degrees in winter or summer. If you think that's not that bad, wait until the afternoon comes -- it can get really cold and windy. So, why is San Francisco so chilly? The microclimates in the Bay Area: There is a wide variety of climates in the Bay Area within miles of each other. It’s considered to have a Mediterranean climate that features hot and dry summers, and rainy and cool winters. However, San Francisco doesn’t experience the hot and dry climate. This is down to its position at the top of a peninsula surrounded by cold water. It can also be attributed to the contrast between the heat of California’s Central Valley and the cold current from the ocean. This set of conditions results in a steady flow of cool air that traverses the area. The Fog: The fog starts rolling in at around 14:30 through the Golden Gate. It traverses the bay sometimes getting into the Berkeley Hills. The outer neighborhoods close to the ocean are usually foggier than other parts of the city, which means they are colder than other areas. You now know the answer to, "Why is San Francisco so cold?" so do bring an extra coat when you visit this beautiful city in case the cold catch you by surprise. Before your visit, we have more great information to offer to make your trip perfect and let you enjoy the city to your extent. It is as simple as nobody calls it that either within the city or outside. That name is just plain weird. If you must use shorthand, “San Fran” will do just fine. I may sound like I'm exaggerating, but this is a hilly city. It is great for pedestrians with wide enough sidewalks and a lot to look at. Do not forget to bring sneakers, it can get really steep. What's more, there is the Haight-Ashbury, the height of the Summer Love in 1969, located at the intersection of Ashbury and Haight streets. A minor tip, Haight is pronounced “hate”. This place is also the home of Janis Joplin and Jefferson airplane. The hippie central place in the 60s now is full of Grateful Dead t-shirt stores and indie cafes. In case you are into pot, this is the perfect place to go. There are quite a lot of gays in San Francisco. It could be the same as your own hometown, just that you may not realize it. It is normal to come across women dressed as men and men dressed as women when you walk around the city. Homeless people that yell at you are not rare as well. The solution is simple, no matter who you encounters, just keep walking. No one will bother you unless you bother them. This refers to the ornate Victorian houses found in the opening credits of Full House, which are located on Alamo square. Besides, some brightly colored ones can also be found in the Haight. You can be a tourist all you want in San Francisco. There are beautiful sights to enjoy throughout the city. Take the cable car meant for tourists -- quite expensive though. Go to pier 39, the top of Coit tower, Ghirardelli square, drive down Lombard street and walk through the Golden Gate Bridge. Closer to the real life, get a burrito, enjoy some sourdough bread, watch a movie at Castro theatre, buy yourself a copy of Howl at the City Lights book store and, of course, wear some flowers in your hair! The beauty, the fun and the culture in San Francisco is just awesome. San Francisco is bursting with different food varieties, from fresh fruits to creative dishes. Whether you like bacon cronuts or Vietnamese bahn, you can find this and much more in this city. Paleo, vegan, omnivorous and even gluten-free people will be overwhelmed by the options available here. Public settings and most homes have recycling and composting bins. Be ready to gaze at the bins for like five minutes trying to decide which bin you should dispose your Ben and Jerry’s container. Like you carry your wallet, ensure you have warm clothing with you. The question, "Why is San Francisco so cold?" has been explained, so you should know no matter how sunny it looks like when you leave the house, temperature changes all the time. Even if you will stay around in one neighborhood all day, you can never tell. You do not want to be caught up in the fog in a light tee shirt. The headquarters of these two companies are in this city. New York is associated with yellow taxi cabs and crowded subways while San Francisco is associated with pink-moustached cars with strangers. San Francisco is ecoconscious. The city impost a 10 cent bag fee in 2013 to ensure people carry a reusable bag. You do not want to end up stuffing avocados in your jeans' pockets or tampons into your purse! A burrito after the other, they are just irresistible! One of the best is found at El Farolito in the Mission. Dessert is also sorted out by several ice cream shops found in San Francisco. Slocombe, Mitchell’s Bi-rite and Humphry are some of the spots with lines around the block. You can never stop at one scoop! Almost all parking spaces are parallel and pretty tight. If there is one driving skill that you have to concentrate on before moving to SF, it has to be parallel parking. It will help you avoid constant honking by other motorists as you struggle to park. Do not worry about scraping and bumping into other cars as you park. People are used to it. In fact, most cars have messed up bumpers. Just because you did not hear a car coming does not mean you are not almost being hit. There are lots of hybrid cars in San Francisco. They are very quiet when running on electric power. Use your eyes more than your ears as you step out to ensure you can cross safely. Why is San Francisco so cold? But cold or not cold, you can always ride a bike. But if you are driving a car, you need to be extra careful about people riding bikes because they are everywhere. You will often hear a bump by a rider informing you of their presence, just in case you forgot. Even if you see nothing through your mirrors, they are there. Just learn to share the road and you will be fine.